BEIJING, Dec. 10,China and Germany on Monday agreed to join hands to safeguard free trade and the international order. The agreement was made between Chinese Premier Li Keqiang and German President Frank-Walter Steinmeier, who is about to wrap up his 6-day visit to China starting from Dec. 5. "China and Germany, as major world economies, are important cooperation partners to each other," Li said. At present, the results of the fifth round of China-Germany intergovernmental consultations, held in Germany this July, are being implemented step by step. 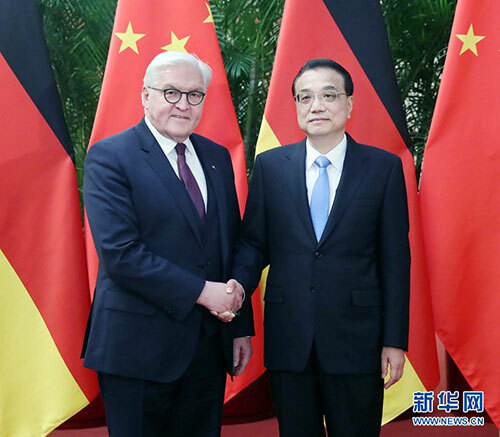 "China will seize the opportunities and develop ties with Germany on the basis of mutual respect and equal-footed cooperation, so as to achieve mutually beneficial and win-win outcomes," Li said. The Chinese premier noted that with continued efforts in opening-up and implementation of new measures, German enterprises in the areas of automobile, chemical industry and finance have become the first batch of beneficiaries. China welcomes more German enterprises to expand investment in China and also hopes Germany will provide a fair business environment for Chinese investors and businessmen, Li added. He also voiced his expectation of more people-to-people exchanges, which will help consolidate public support of China-Germany ties. Stressing the importance of protecting multilateralism and the rule-based international order, Li called on both sides to stimulate vitality of global development and jointly push forward the world's economic and social progress. For his part, Steinmeier said he has felt the tremendous vitality of China's economic development, as well as the increasingly closer people-to-people exchanges between Germany and China. In the past few decades, as relations with China grew ever faster, Germany benefited from China's reform and opening-up, Steinmeier said, adding that his country stands ready to further expand trade and investment in China, boost bilateral dialogue, and jointly safeguard free trade and the existing international order.